The iThemes Security Plugin includes 10 ways to harden WordPress. 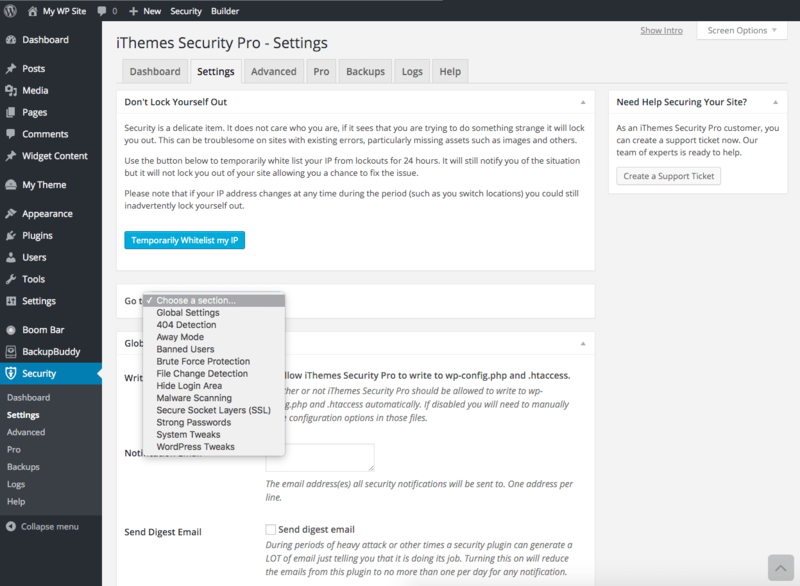 After installing and activating iThemes Security, visit the Settings tab to activate these feature designed to harden your WordPress site. With iThemes Security, you can force users to use strong passwords as rated by the WordPress password meter. WordPress password security is the simplest way to harden WordPress. iThemes Security allows you to change the WordPress login page URL (wp-login.php, wp-admin, admin and login), making it harder to find by automated attacks. Changing the default WordPress admin URL also makes it easier for users unfamiliar with the WordPress platform. 404 detection in iThemes Security looks at a user who is hitting a large number of non-existent pages and getting a large number of 404 errors. 404 detection assumes that a user who hits a lot of 404 errors in a short period of time is scanning for something (presumably a vulnerability) and locks them out accordingly. This also gives the added benefit of helping you find hidden problems causing 404 errors on unseen parts of your site. As most sites are only updated at certain times of the day, it is not always necessary to provide access to the WordPress dashboard 24 hours a day, 7 days a week. The options below will allow you to disable access to the WordPress Dashboard for the specified period. In addition to limiting exposure to attackers, Away Mode is also useful to disable site access based on a schedule for classroom or other reasons. The Banned Users feature in iThemes Security allows you to completely ban hosts and user agents from your site without having to manage any configuration of your server. Any IP addresses or user agents found in a customizable list will not be allowed any access to your site. If one had unlimited time and wanted to try an unlimited number of password combinations to get into your site they eventually would, right? This method of attack, known as a brute force attack, is something that WordPress is susceptible to by default, as the system doesn’t care how many attempts a user makes to login. Using WordPress brute force protection to limit logins will ban the host user from attempting to login again after the specified bad login threshold has been reached. iThemes Security provides a WordPress malware scan powered by Sucuri SiteCheck. The scan checks for known malware, blacklisting status, website errors, and out-of-date software. iThemes Security gives you the option of turning on SSL (if your server or host supports it) for all or part of your site. By enabling the options in the plugin, you can automatically use SSL for major parts of your site such as the login page, the admin dashboard or the site as a whole. You can also turn on SSL for any post or page by editing the content and selecting “Enable SSL” in the publishing options of the content in question. WordPress’s XML-RPC feature allows external services to access and modify content on the site. Common example of services that make use of XML-RPC are the Jetpack plugin, the WordPress mobile app, and pingbacks. If your WordPress site does not use a service that requires XML-RPC, we recommend using the “Disable XML-RPC” setting to prevent attackers from using the XML-RPC feature to brute force attack the site. Get the #1 WordPress Security plugin with over 30+ ways to protect your WordPress site including scheduled malware scanning, two-factor authentication, ticketed support and more.